Your quick and simple way to master financial statement analysis! You’re just minutes away from the very best that financial analysis experts have to offer. A unique approach. 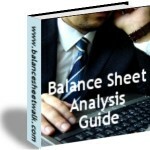 Balance sheet analysis skills are easy to acquire with the right information. Pure step by step knowledge designed to enhance strategic management skills. Increase revenue with informed decisions. The “Profitability” section below is a sample from the Balance Sheet Analysis Guide. Profitability is a measurement of operational performance. Profitability represents the operating performance of a business expressed as a return on sales after all costs have been covered except interest and tax. EBIT is Earnings before interest and tax. A summarized form of the income statement is below, to show how to calculate EBIT. Note: You may be using another term for EBIT e.g. PBIT (Profit before Interest and Taxes). From the profitability diagram above, it can be seen that this business has a profitability of 12.21%. For every $100.00 of revenue, the business makes a profit of $12.21. Revenue went down or expenses went up. The drivers of profitability are revenue (price and volume), cost of sales and expenses. “Drivers” – these are the key items that, if changed, will affect Profitability. Revenue may be able to be improved by selling more (sales volume increase) or increasing prices (sales price increase). The marketability potential of the products or services of the business may need to be investigated to determine the potential revenue for the business. To improve profitability, the business should improve revenue and try to get cost of sales and expenses down. To maximize profits management should allocate resources in the most efficient way. It also provides a measurement of operational efficiency in the profit and loss account, void of finance costs. Profitability will vary across industries – it may be useful to obtain typical values for your industry so you can compare your results with others. Here is a table of each of the drivers or “Strategic actions” for profitability. To increase profitability from 12.21% to say 15%, calculate how much each driver needs to be changed to achieve the desired profitability. These are shown below in order of the smallest change. Notice that a price increase of only 3.28% is required to achieve the desired 15% profitability, whereas a sales volume increase (“more sales”) of 11.21% – almost 4 times as much – is required to achieve the same target. The target can also be achieved by reducing costs of sales by about 5% or reducing expenses by about 10%. In practice, you may decide to implement a combination of the drivers to obtain the target. The drivers are useful in that they give you a starting point; they are a list of actions that should be considered to improve performance. The blue bars on the diagram above are a visual indicator as to how easy it is to implement each action – the longer the bar, the more difficult it is to achieve. Every business will have a different set of numbers, and the order of ease to achieve will depend upon your own financials. The above is the Profitability section of the “Balance Sheet Analysis Guide”. The full table of contents is shown below. The income statement and balance sheet are linked. Balance sheet format change for financial analysis. Why do we separate finance from operations? How is finance separated from operations? Working capital:- Accounts Receivable (AR)/ Debtors days. - What effect will a change in AR days have? Working capital:- Accounts Payable (AP) / creditors days. - What effect will a change in AP days have? Working capital: - Inventory days. What is a good value for ROCE? - What is the difference between a sales price change and a sales volume change? - Goal seeking can be used to find strategies to improve ROCE. - Example: list of strategies to improve ROCE. Equity - what it returns.  Determine the financial strength and economic efficiency of a business.  Understand how short term management decisions effect long term value creation.  Understand the benefits of separating Funding and Operations on the Balance sheet.  Learn the role of DuPont model in financial analysis techniques.  Understand the role of ratios and cash flows in Balance sheet analysis.  See where how and why particular ratios are used.  See if the normal business operations are generating profits or incurring losses.  Learn how to determine efficiencies with ratios.  Discover how working capital management impacts on balance sheet performance.  See the techniques to use to drive future strategic management decisions.  View the relationship of Operational cash, Free cash flow and Net cash.  Understand the effect of the Debt to Equity mix and leverage. Click the Buy now link below to get your copy.